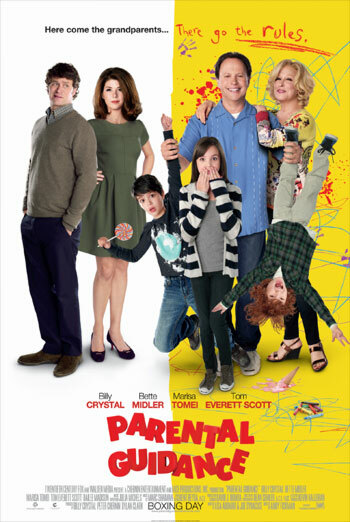 PARENTAL GUIDANCE is a family comedy about a couple who look after their three overprotected grandchildren when their daughter and her husband have to go out of town. When one of the grandchildren is reintroduced to his grandfather, Artie, he decides to refer to him as 'Farty' instead. Later on Artie and his grandson are at a professional skateboarding event, where the young boy tells his grandfather that he needs to go to the toilet. The boy is then seen standing on a half-pipe skateboarding structure, urinating off the edge as a skateboarder performs a stunt below. There is also scene in which Artie has to try and help his grandson go to the toilet. Artie sings a song to encourage him, which includes references to 'Mr. Doody'. The film contains uses of very mild bad language (e.g. 'heck', 'fart'). At one point, Artie and his middle grandchild are shown watching an instalment of the SAW horror film series. The scene is comic and there is no sight of actual horror on screen.